ServiceCorps Fellowship — ServiceCorps | Leadership For Good. The traditional career path prevents new college graduates from committing to immersive service opportunities without: 1) compounding student loans, and 2) sacrificing career aspirations. And yet, national service is proven to develop engaged citizens and more successful private and social sector leaders. That's why ServiceCorps is reinventing the career path…for good. In 2016, we launched the flagship program of the service year movement, the ServiceCorps Fellowship. To date, 28 Fellows have served at 19 nonprofit organizations in Boston and NYC. 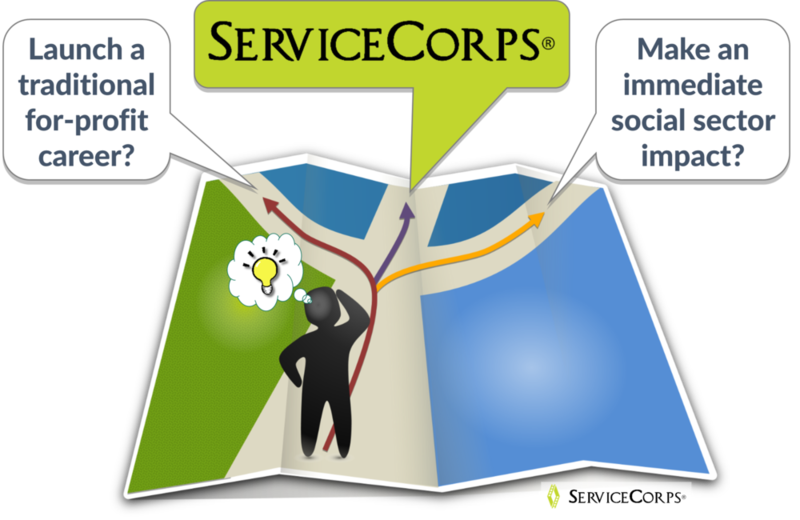 ServiceCorps is democratizing national service in America by empowering emerging leaders to make an immediate social impact and equipping them with the skills and resources they need to launch a meaningful career. During the yearlong ServiceCorps Fellowship, Fellows receive rigorous leadership development training and living stipends that cover 100% of student loan payments so they can join a dynamic community of top college graduates serving at social sector organizations. After one year of high-impact service with our Social Sector Partners, Fellows have the option to stay in the social sector (potentially with their placement organization), launch a career in the private sector, or pursue advanced studies (Masters, JD, MBA, MD, etc.). Fellows join our alumni community, The Corps, as more mature, socially-engaged employees, who are poised to make greater contributions to their companies and communities. We hope you'll consider starting your career with us.